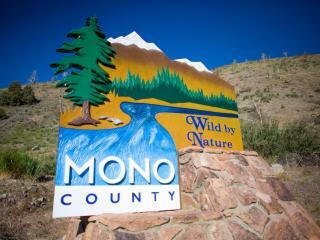 The largest watershed in Mono County, Rush Creek is also one of the most popular fisheries in the state. The nearly 30 mile-long creek begins as High Sierra snowmelt and runs down to June Lake, past Gull, Silver and Grant Lakes, and into Mono Lake. Rush Creek not only carves it way through the beauty of the “Switzerland of the Sierra,” as the June Lake Loop is called, it is also home to plenty of truly world-class trout fishing. Highway 158 follows Rush Creek as it makes its way around the June Lake Loop, offering all kinds of roadside access and quality camping, cabin rental and hotel options. While not technically a freestone creek, Rush Creek also a provides a nice moving water change of pace to the stillwater lakes of “the Loop.” While anglers of all types enjoy casting days away at Rush Creek, it is an especially popular place for fly fishers. Luckily, some of the best places to fish Rush Creek are by the resorts at Silver and Grant Lakes, making access easier. The large lakes also provide holding water for the large browns Rush Creek is famous for. The small creek can be home to some impressively large trout. The chance of catching a 20-pound trout in the skinny waters of Rush Creek has made it a popular spot for anglers for more than a century now. Directions: Highway 158 follows Rush Creek from June Lake all along the June Lake Loop to Grant Lake. There is also access to Lower Rush Creek from the Highway 395 bridge. 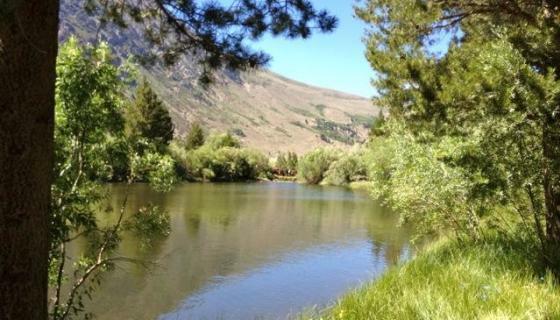 There are numerous campgrounds, resorts and hotels along Rush Creek as it follows the June Lake Loop. The best access for the creek is in the lower loop by Silver and Grant Lakes. The Aerie Crag RV Site and Silver Lake Campground are both located along the banks of Rush Creek. Aerie Crag is first come, first served. For more information or to book a site at Silver Lake Campground, please go to recreation.gov or call 877-444-6777. 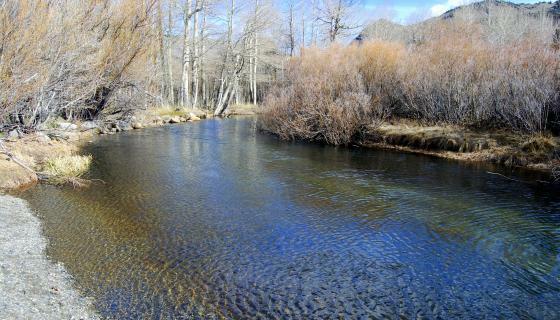 Most folks who love to fish the Eastern Sierra will usually place Rush Creek among their favorite places to cast, and they do so for good reasons. Rush Creek provides lots of easy, roadside access and is an exceptionally healthy and productive fishery. It’s also downright gorgeous. The best places to fish Rush Creek are near its inlets and outlets at the lakes of the June Lake Loop. Sections of Rush Creek, especially those above and below Grant Lake, are considered to be naturally reproducing (or wild trout) fisheries for browns since that species hasn’t been planted in these waters for decades. A 20-pound, 8-ounce German brown was pulled out of Rush Creek near Silver Lake in 2013. Besides the big browns, Rush Creek is home to lots of rainbow trout and the occasional brookie, too. Directions: Highway 158 follows Rush Creek from June Lake all way along the June Lake Loop to Grant Lake. There is also access to Lower Rush Creek from the Highway 395 bridge.